Religion can bring out the best in people and sometimes it can bring out the strange in people…add some marketing, commercialism and good ol’ creativity and you never know what you are going to get. Possibly the strangest Photoshopped image of Jesus I’ve wandered across – Jesus Playing a Theremin. Even stranger, I, Producer Neil, own a Theremin! No joke. They are strange but cool. What’s a Theremin you ask? The King of the Jew-rasic Park? Listener Nathan sent me the strange image on the left showing Jesus lovingly holding a baby dinosaur (Photoshopped). I searched online to find the original (on the right) so you can see the difference for yourself. It’s an obvious attempt to mock Christians but…that doesn’t mean it ain’t a little funny. I just love this Easter egg sent to me by listener, Greg. It is obvious his son is a talented artist with a great sense of humor! The wink just slays me! I just love this three pronged attack; “penetrating power of magnets”, “soothing power of copper” and oh yeah, the “healing power of Jesus”. Be honest, does this manger make me look boxy? Yo, yo, yo Merry Christmas Finally, a Christmas ornament that speaks to both my love of Jesus and violent gangsta rap! At this point, isn’t this just three guys with crowns standing around a camel? Uh, who exactly is this message for? Is it me or is this sticker a little narrow minded and bigoted? I got a sweet tooth for the sweet truth! Hey kids! We made an ancient torture/execution device into a candy that explodes in your mouth! Yay! Ya gotta love this old Valentine…very direct…and bowling screams romance don’t it? Call me a hopeless romantic but I’m a sucker for an old school Valentine…especially when they imply unrequited love will be met with violence. Bravo Hanna-Barbera, bravo! I found this little vintage gem at the Rose Bowl swap meet some months ago. This image is fantastic in so many ways…how you ask? Well, it’s a painting of a huge Jesus standing over a tall radio antenna and a gaggle of 1950’s folks donning their fancy hats for one, and for two, look closely at the swap meet price tag (still attached)! What a treasure! Just beautiful. This artist creates sculptures from a single piece of paper. Make every night seem like the wedding at Cana! Am I buzzed or did the Spirit just move? My mom is wonderful…she cuts-out and mails my wife and me cartoons from the news paper all the time. Here is a recent one that gave me a chuckle and reminded me how being a little wrong can have big consequences. It’s not the amount of lights…it what you do with them that counts…right? I snapped this photo in my local Ralph’s supermarket…I don’t know about you, but I am not OK with eating little “Siamese” children…especially during Christmastime. I wonder if the dog is Catholic or Paw-testant? Let’s see, I remember Barry, Robin, Maurice and Andy…nope, don’t remember a Jesus Gibb. The cross necklace USB thumb drive. It says to the world, Jesus is in your heart and your Q1 sales earnings Power Point slide presentation is conveniently at hand also. Cater to all those super religious 5 year olds who hate candy. Let’s face it, those heathens at Google Earth had it comin’! Why gummy candy Jesus sandals you ask? Because gummy bears are just to secular, that’s why! If you are walking on the beach and you see only one set of footprints, and those footprints say “Jesus Loves You” in them, you might just be walking alone. Do you think this image inspired Carrie Underwood? Ya just gotta love people who read into scripture. Hmmm, I thought he was more of an apple shape. This little contraption out of Japan forces helpless pears to grow into the shape of Buddha. Seems innocent enough until you have a mouthful of Buddha’s back-side. I found this little gem on the Internet…apparently it was this “family’s” Christmas card. The strangest part of this photo is that it looks like the dog is the only one who understands the weight and theological ramifications of the situation. John, three, sixteen…hut, hut, hike! Is that little rug-rat seriously trying to sac Jesus? This is a statue of Vladimir Lenin, Mickey Mouse and Jesus. How good would your kids be if this was their new “time out” chair? Standing almost 6 ft. high this sculpture of Jesus made in Sweden is entirely made of Lego building blocks! Ok, I’ve seen all the images of Jesus in food and stains that you have so I don’t usually put those on the website but, this one is a new one to me…Jesus in an X-Ray! Hmmm, I thought Chuck Heston played Moses not Jesus…(yes, someone Photoshopped this). Uh, these little beauties are “Faith Chips”, but I’m not sure what they are used for. Maybe there is a Christian alternative to Las Vegas…yup that’s it, Sinless City! There you can play games like, HeRules-lett or take your chance on the Lot Machines – but be careful, three pillars of salt and you lose bigtime! Here are some checks with the likeness of Jesus on them. Unfortunately, the illustration of Christ on the top check looks as if he is praying that the check will clear…not a good sign. Have you been to the Haunted Mansion at Disneyland? 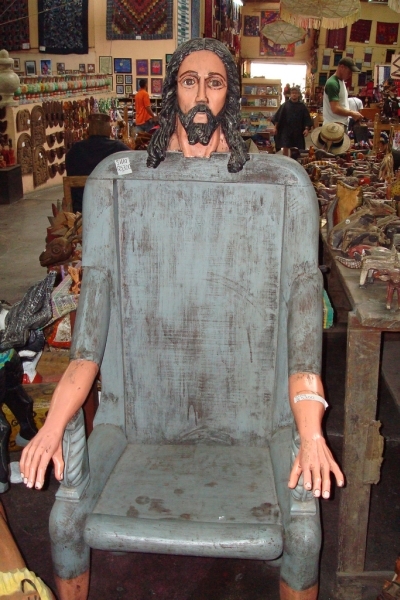 Well, this “Miracle Eyes” bust of Jesus works on the same principal as the haunted busts in the hallway of the Haunted Mansion that follow you as you walk on by. I had this little gem up in my office at KFI for a while…visitors said it “creeped them out”. I think Jesus’ all seeing and following eyes just spiritually convicted them…right? These cute (but strange) little guys are knitted Jesus sandals for wee tikes. A thoughtful gift for the toddler with cold feet but a warm heart. Guaranteed to walk on water (as long as it is frozen). This “Look Good For Jesus” compact mirror was sent in by listener Teresa. Thanks Teresa! I’m not sure how this jives with the concept of vanity but one has to imagine God endorses good personal hygiene. Besides isn’t cleanliness next to Godliness? Here is an enlargement of the back of the mirror…kind of says it all doesn’t it? This is a custom Jesus cell phone cover. Gives a whole new meaning to “called by Jesus”. Listen, I enjoy Christmas but I can’t say that I have ever thrown a “Jesus Birthday party”. But, if I did, it sure is nice to know there are tasteful, paper serving supplies that exist out there. Here is a possible cake option for the party. Yet, another possible cake. Don’t miss the candles replacing the nails in His hands and feet. I just don’t know what to make of things like this. I hope it’s angel food. You could wrap the gifts in this niffty wrapping paper adorned with the birthday Boy’s face on it. I have a fantastic painting of Christ in my home, the artist chose to paint His face in yellow – I refer to it as my “Jaundice Jesus”…this toy reminds me of that painting a little. I’m not sure what the whole “Astronaut Jesus” angle is here but I like His big orange boots. Uh…uh…hmmmm. This is the “God-Jesus” robot out of Japan and is sort of like an electronic “Magic 8-Ball” – ask it a question and it gives you an answer. The thought of Christ’s face being seared into my filet mignon creeps me out. These might come in handy if you burn yourself on the “Jesus Pan”. With the amount of men who pray without ceasing on the golf course already, these club covers with Bible quote printed on them might just be a real blessing. Look at this custom Jesus hot air balloon! Up, up, and away in my beatitudes, my beatitudes balloon…. Yes kids, you know who else smokes? SATAN! Check out this ultimate velvet painting! The King of the universe meets the king of rock and roll. One loves to eat Monte Cristos…One is the Cristo.